You enter the maze. You confidently walk down the beginning stretch, your hand lightly touching the stalks of corn lining your path. Before long, you have a decision to make. Right or left? You quickly choose and follow the path to the right. Before much longer, you are facing another choice. You turn left and quickly find a dead end. You backtrack and follow the right path leading to another option of paths. You are far less confident now. Right or left? Right…or…left? Suddenly you realize that like the rest of the maze-goers, you too have are not going to escape the maze so easily. Mazes were used anciently as a way for people to look within themselves, almost as a spiritual journey of sorts. Such mazes, known as labyrinths, are different from the fun, confusing mazes that we know today as they were not intended to be confusing. It might be introspective, but most of us go to mazes for the thrill of the unknown. People of all ages love mazes and the puzzle they pose. Any group, from large families or individuals, may be seen patronizing mazes for the brain-teasing, yet fun experience. Mazes allow us to think deeply, improve memory, and use our sense of direction all while providing a fun experience. We all know why corn mazes are fun. An equally important factor in a successful corn maze is how it is made. There are two main parts of creating a good corn maze: the creation of the maze, and the theory behind the layout of the maze. Building a corn maze can be broken down into a few main steps. First, there needs to be a design. Many mazes are made of straight walls, with the paths forming in between the wall’s connections. This allows for straightly planted and easily maintained rows of corn. Other mazes utilize pictures, logos, or other intricate image based blueprints to make the maze layout. A great benefit of corn mazes is that this is easily done as the corn can be cut how maze owner pleases. This allows for surety in the maze layout, ending in a clean design. Once the design is in mind, the next step is cutting the maze. The best way to guarantee ease in cutting the paths and quality design is to cut the paths while the corn is short. By doing so, there is less effort expended in the cutting and less monetary expenditure if you want to hire cutters. You don’t want weeds or garden debris on your maze paths, so regular maintenance and a layer of straw will help keep paths clear. The last step is less about corn and more about business practices. What will make your maze unique? If someone visits your maze, are they done because they already solved it, or is there anything that you offer that will bring people back (games, livestock, events, etc)? Building a successful corn maze involves the obvious aspect of having a maze as mentioned above. Just as critical, however, is the theory of your maze. Mazes are fun unless they are super easy to solve. People are not attending mazes to spend 20 minutes walking through a maze with an obvious solution. Most mazes are going to take 1-2 hours to complete. That is part of the fun, getting lost, thinking you found your way only to be lost again and maybe finding the exit after that. Utilizing several simple techniques allow for the maze to be challenging, but very solvable. Avoid using the inside border of the maze as part of the solution as many people will be hesitant to leave this area and go deeper into the maze. By utilizing the belly of the maze, you are using all your space and creating a bigger challenge. Multiple solutions will allow people to complete a maze quicker as they stumble upon a way out by chance. One solution allows for a more challenging and entertaining experience. Involving shapes that break the even, geometric flow of the maze throws off the maze-goers. They are used to straight paths and walls, and the curves help throw off one’s sense of location and direction. When someone just came out of a confusing series of twists and turns, the last thing they want to do is to make a turn that will point them back in that direction. So maze creators can effectively use this to through maze-goers off the right trail. These are just a few of many effective strategies to make a challenging maze experience for anyone trying to solve it. The purpose of maze going is putting yourself in a difficult puzzle and trying to solve, the essence is wanting to beat a challenge. By following these principles, building a corn maze can be very doable. When done right, a corn maze can be an experience that brings families closer through fun, encourages the use of critical thinking, and provides a quality attraction for people of all ages. 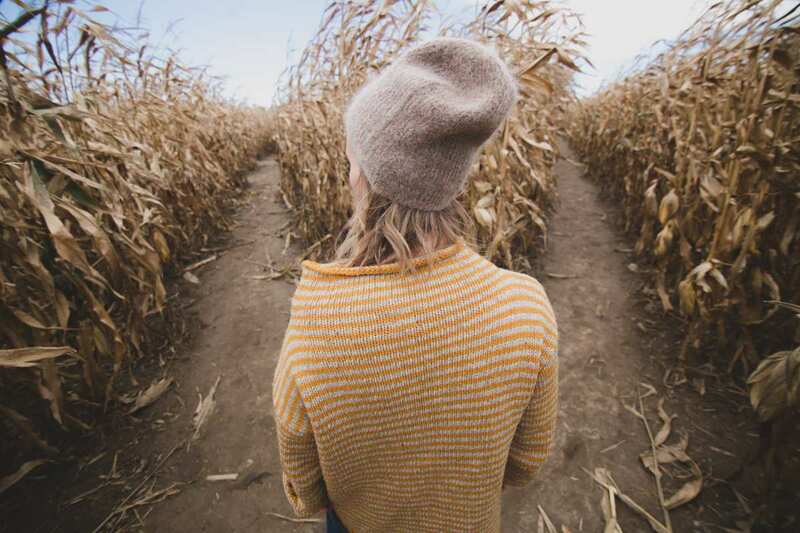 If done right, corn mazes encourage a journey, but like their labyrinth roots, it is one of enjoyment.